The Selecta division of Silvan Australia has added a compact portable water transfer pump to its Selecta Power range of general purpose solutions for specific tasks in agriculture, industry and service businesses. 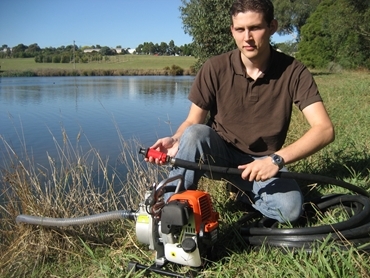 Powered by a four stroke petrol engine and with a pumping rate of 115 litres a minute at pressures up to 2.5 Bar (or 40 psi) this portable water transfer pump will serve a large number of emergency needs, general property applications or anywhere a convenient water transfer solution is needed. The Selecta Power LBA-115 portable water transfer pump is an ideal unit to have on hand in the garage, workshop or carried in a tradesman’s or farmers vehicle. The 33.5 cc four stroke petrol engine means there is no need to mix fuels and it has a 0.6 litre capacity moulded tank within the engine and convenient carry frame. The engine will give up to 70 minutes of operating time on a full tank at maximum revolutions or close to three hours when running at idle. The engine on this water transfer pump has electronic ignition, a single element air filter and uses a manual recoil rope start. It achieves a maximum power of 0.9kW (or 1.21 hp) at 6500 rpm. The pump itself is a direct coupled centrifugal impeller type casting with a total head of 25 metres and a suction lift of 3 metres. It is fitted with 25mm or 1 inch BSP threaded inlet and outlets. With an all up weight of only 8 kgs the Selecta Power compact portable water transfer pump is supplied with a suction strainer and two hose connections so that only hoses of an appropriate length are required. The entire portable pump and engine unit is contained within a welded tubular steel carry frame with rubber bumpers. “We consider it will fulfil numerous water transfer or emergency requirements as well as being a useful addition to any service, farming or maintenance need,” says Selecta spokesperson, Leigh O’Rielly, of the Selecta Power compact portable water transfer pump.